I was having a conversation with a couple recently and was very much enjoying listening to their lovely Briton accents. One hails from Ireland, the other from Scotland. Inside my over active imagination I could hear bagpipes piping and see kilts swinging all keeping in time with the lilt of those accents. When asked for my ancestry, I quickly replied with great pride that I was Scottish and that no one could doubt that with names like Armstrong (paternal) and Mackenzie (maternal). In truth I’m most proud to call myself Canadian, but it’s always fun to hail back to the “mother land” when in conversation with someone from the British Isles. I first visited England and Scotland with my mother when I was a teenager. We spent two wonderful weeks exploring the wee villages and historical sites, getting from place to place in a red Austin Mini which barely fit the two of us and our luggage and had essentially no heating. Apart from being chilled to the bone for the whole trip, I absolutely fell in love with this part of the world, especially Scotland. When God first made the world, he looked at the bare and barren hillsides and thought how nice it would be to cover them with some kind of beautiful tree or flower. So he turned to the giant oak, the biggest and strongest of all of the trees he had made, and asked him if he would be willing to go up to the bare hills to help make them look more attractive. But the oak explained that he needed a good depth of soil in order to grow and that the hillsides would be far too rocky for him to take root. So God then turned to one of the sweetest and most beautiful of all the flowers – the rose. God asked the rose if she would care to grace the rugged highlands with her splendour. But the rose explained that the wind and the rain and the cold on the hills would destroy her, and so she would not be able to grow on the hills. Disappointed with the oak, the honeysuckle and the rose, god turned away. At length, he came across a small, low lying, green shrub with a flower of tiny petals -some purple and some white. It was heather. God asked the heather the same question that he’d asked the others. “Will you go and grow upon the hillsides to make them more beautiful?” The heather thought about the poor soil, the wind and the rain – and wasn’t very sure that she could do a good job. But turning to god she replied that if he wanted her to do it, she would certainly give it a try. God was very pleased. He was so pleased in fact that he decided to give the heather some gifts as a reward for her willingness to do as he had asked. Firstly he gave her the strength of the oak tree – the bark of the heather is the strongest of any tree or shrub in the whole world. Next he gave her the fragrance of the honeysuckle – a fragrance that is frequently used to gently perfume soaps and potpourris. Finally he gave her the sweetness of the rose – so much so that heather is one of the bee’s favourite flowers. And to this day, heather is renowned especially for these god given gifts. Heather is a hardy, prolific plant native to Scotland, Ireland, Scandinavia, Russia and North America. However, this pretty plant may be known best for covering the moors of Scotland with its lovely purple blooms. As the folklore story above suggests, this plant has been revered over the ages for its strength, hardiness, fragrance and sweet taste. Heather was used for making brooms, baskets, rope, roof thatching, soaps, tea, medicine and even ale. Although heather still grows wild in Europe and North America, it is also cultivated as a landscaping plant and is also used in formal flower designs. The scientific name of the heather plant is Calluna Vulgaris, deriving from the Greek “Kallune,” which means “to clean or brush” and the Latin “vulgaris,” which means “common.” The name refers both to the fact that in the past wild heather was often made into brooms for sweeping, and that it is an extremely common plant in the regions where it grows. The heather flower colour influences its meaning. Purple represents admiration and beauty and pink is good luck. White heather is rare and much like a 4 leaf clover in celtic mythology, white heather represents exceptional good luck and protection from danger. One legend says that white heather grows only over the burial grounds of the fairy folk. I love the outcome of this arrangement. Great for home decor or as a gift. Make 3 and group them on a shelf, mantle or dining table. Measure the height of container and cut heather twigs about 1 inch longer. You will need to use strong garden clippers. Cut enough heather to densely cover the container. Wrap double sided tape around the top edge and bottom edge of container. Press the heather twigs onto tape, so there is about ½” sticking beyond the top and bottom of container. Be sure the flowery end of the twig is on the top edge of the container. Continue until the container is completely covered. Trim the bottom edges of twigs so they are flush with the bottom of the container. Stretch elastic band midway over the twigs to hold them securely. Cut soaked floral foam and fit into container. Cut pittosporum in 3” lengths and uniformly insert into foam so they peek about 1” above top of heather edging and you have a slightly domed shape. Cover foam completely. Insert 3” lengths of china berries randomly through the pittosporum. Cover elastic band with raffia or ribbon. Water daily to keep foam moist. Spritz the heather so it doesn’t become brittle too quickly. Arrangement should hold up for at least 10 days. Note: You could use rosehips instead of the china berries and ruscus instead of pittosporum. And if you can’t find heather, rosemary will substitute nicely. 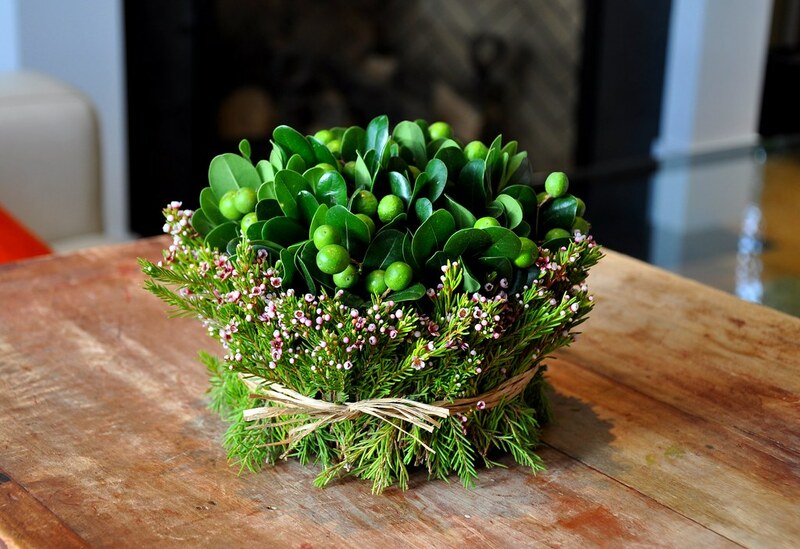 This entry was posted in Floral Arrangement, Floral Design, November and tagged Chinaberries, Floral Arrangement, floral design, heather, pittosporum. Bookmark the permalink. Both comments and trackbacks are currently closed. Liz, this is stunning! I love it! Yes, the photographer is definitely a keeper . So happy to have you as a regular visitor. Do you have a favourite flower?